If the mark of a great city is the opportunities it provides to people coming into it from other regions, then Chennai does belong up there. While there is some mild jingoism about Tamil language, culture, heritage etc., I'm hard pressed to think of any state in India besides Tamilnadu that carries a refrain similar to 'வந்தோரை வாழவைக்கும் தமிழகம்' (roughly translated as 'the Tamizh land that fosters any who comes'). And MGR is one of those who was fostered very well. Of Keralite origin, born in Sri Lanka, his first role was in a movie directed by an American who knew no Tamil (Ellis R. Dungan); but then he went on to become a leading actor, on to be the state's Chief Minister and even 21 years after his death, remains a larger-than-life, influential figure in the politics of the state. The plaque at the MGR memorial on the Marina seems too bland - does not quite capture the phenomenon that he was and the hysteria he inspired in the population of Tamil Nadu. Suresh Reddy is a record holder (Limca Book of Records) for picking out the most number of needles from a pile of sand, using just his eyelids. He didn't go for the record when he performed at a company's in-house function on Saturday, but did show how the needle-picking was done. His karagattam was pretty good by itself, including this bit of dancing on top of 3 Coca-Cola bottles. But the best part of the show was a bit of vegetable cutting that he performed (http://www.youtube.com/watch?v=Z4Owo2fiPpk) that did not have much to do with karagam. It is very difficult to believe that just north of this bend in the Adayar is one of the most crowded intersections of Chennai: the Chamiers Road-Cenotaph Road junction, which is where quite a lot of the traffic from the IT Corridor pours out as it flows towards other parts of North and West Chennai. But noon traffic was light enough to stop and take this picture. A carriageway is being planned along the sides of the Adayar - sure hope that it will not affect the river itself, or reduce the greenery along its sides. One of the most well known food secrets of Chennai is Cornucopia, THE restaurant for European style food. Very unpretentious, with just about 20 tables, you might miss it if you are driving too fast on Cenotaph Road. The cooking is excellent, the portions just right (and you can choose half portions, too), the service runs smoothly as a background process and the prices are reasonable. What more can you ask for? Horses, cows, bullocks, buffaloes - they were all pretty common sights on the streets of Chennai until about 20 years ago. It has been quite a while since I've seen a horse graze on the by-lanes of the city. This one was just 50 metres or so away from TTK Road, behind the Benjarong restaurant - so very much heart of the city, in Alwarpet. The law abiding owner has made sure that the horse has been tethered on the side away from the 'No Parking' board! This shop (is that really what it is?) sign on TTK Road has intrigued me since I first noticed it about 4 years ago. It indicates a completely new theory of diagnosis and cure, one that is based on study of the wallet rather than of the anatomy. Haven't seen crowds milling around it, waiting to be cured of their ailments for Rs.5 a pop, so maybe there is something deeper to the "5 Rs Health" after all. In many places, they don't know about it at all. In several others, they do it behind closed doors, when the day's work is done and it is time for some relaxation. But it is only in Chennai that they do it in the open, through the day, with many onlookers. No wonder then, that Chennai is home to the only Arjuna awardee in this sport, a 10-time National Champion and two time World Champion, whose name would make almost any non-Chennaiite go, "Hunh??". Did Maria Irudayam make the sport popular in Chennai or did he reach his destiny because of the game's popularity in Chennai? And how about Ilavazhagi, the newest world champion, also from Chennai? It really doesn't matter. 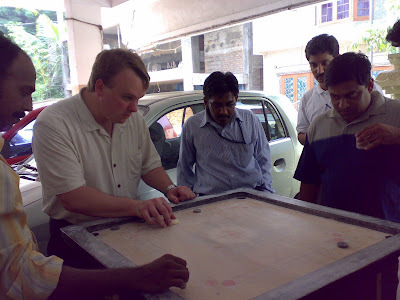 Carrom is so common in Chennai, and so apparently easy, that even a first time visitor to India falls for it in no time. There's Tim, on his second day in India, chasing the whites, blacks and red!! Somehow, making an extra effort to ensure safety while crossing roads is something that very few Chennaiites like to do. In the days when the IT corridor was still Old Mahabalipuram Road (OMR), people getting to the other side were a speed-breaker; but IT corridors should not stop for anything and road-crossers have now been given overhead walkways that thankfully do not look out of place on the road. All these walkways are near the MRTS stations. Obviously. But, considering the platforms at these stations are elevated, wouldn't it have made more sense to also enter the walkway directly from the platform? Was that thought of at all? Here's a view of the Indira Nagar station, with the walkway in front of it. With most of the station buildings themselves not having been completed, it would have been far better to have made that platform-entry provision now, rather than break down walls a few years later. The only National Park in the world that is completely within a city (it is also supposed to be the smallest National Park in the world) is the Guindy National Park (GNP) in Chennai. 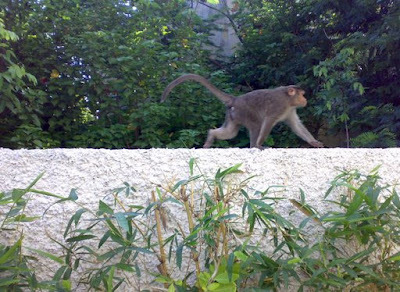 But if you are in Chennai, you don't have to go to the GNP - some animals come home! While there are flyovers coming up at several places, the construction activity at those places has made regular traffic much more difficult than it was earlier. That's only to be expected; but to me it seems that the Panagal Park area is a little less congested than it used to be. I'm basing this on shaky ground - 2 trips through the area last week and neither of them during the peak hours. For those who would have data to refute my anecdotalism, the good thing is that it looks like this flyover should open up in about 6 weeks. There are still a couple of more flyovers that are under construction, but all that activity would be completed by the end of the year. And then the next round of digging will begin, for the Chennai Metro - a city builder's work is never done! Being the only 'place of worship' so close to the headquarters of the Metropolitan as well as the State Express Transport Corporations, it is easy to imagine that whenever a new bus was brought in, it must have been taken to the nearest deity, Muniswaran, for the pooja. It is no surprise therefore that over time, this rather non-descript shrine has acquired a niche expertise in guaranteeing the welfare of vehicles and drivers; this Muniswaran is now something like a patron saint for those citizens of Chennai who make a living with their driving skills. But a couple of incidental points surprised me. One was that my driver, Chakrapani, is firm in his belief that it is only because of his role as a protector that the Muniswaran near Pallavan House is called the 'Bodyguard Muniswaran'; the other was that for a famous - and reportedly much revered patron saint - the temple of 'Bodyguard Muniswaran' (not much more than a roof over an idol on the footpath) did not seem to be crowded at all. Maybe I was there too early in the day. There's a story behind Chakrapani's theory for 'Bodyguard'; but I believe the explanation is far simpler. Pallavan Salai, before it was called so, was known as Bodyguard Road. So there. I did not think that taking a picture of the early morning Marina would be so difficult. My lack of photography skills meant that whenever I pointed the camera to the sea, I got lousy pictures. And then I saw these two gentlemen. You must remember that along its length from the Triumph of Labour statute to the Lighthouse, the morning Marina is the place for limbering up one's body. On any day, there would be hundreds of people doing various things to make sure their bodies are toned up. Not for them the air-conditioned, claustrophobia-inducing gyms and health centres that seem to have come up at every street corner. They are the people who crave the sun and the wide open space to refresh both body and mind. And so there they were, the slow walkers, energetic runners, t-shirt ripping muscle builders and all manner of exercise takers. But these gentlement were unique. Looking quite different from each other in many respects, they were united in turning their backs to the sun. That set them apart completely from almost all the others. No one else seemed to be as sure of their 'look west' policy as the two of them. Taking a cue from their certainty, I pointed my camera in the same direction as they were facing - for much better results than I had had until then. All those lovely photos planned of the Marina will have to wait for another day. At some time, the Kodambakkam bridge was part of schoolboy chants and taunts; the second railway overbridge on the Beach - Tambaram suburban line, it once commanded an uninterrupted view of the Chennai skyline. Some of my friends have told me that, when the LIC building caught fire on July 11, 1975, they could see it burn from the top of the Kodambakkam bridge. And I can imagine that, 30 years ago, the only other tall structure between the bridge and the LIC building would have been the steeple of the Church inside the Loyola College. Today, one can look down at the Kodambakkam bridge, in a way. While there is no place to stand or walk on the new flyover connecting North Usman Road with Mahalingapuram Main Road, I somehow expected the top of this flyover to be on level - or just slightly taller than the bridge. The photo shows otherwise - or is it just a trick of the eye? 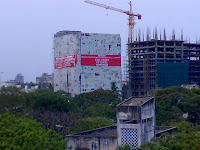 And see those skeletons of the hoardings? Being on private buildings, they are spared the Corporation cutdown - but are they going to remain like this? The TOI has been threatening a Chennai edition for a long time; I'm not sure of this, but I believe one was even brought out for a short while before folding up. This time around, Bennett, Coleman & Co. seem to have got it right. This edition will stay. Was tempted to subscribe to it; the 'Charter Subscriber' offer included a 'certificate showing that you are one of the first to subscribe in Chennai', a thermos flask and a price of Rs.299/ - for the first year. A month's supply of the newspaper would weigh about 5 kilos and at a rate of Rs.5 for old newsprint, the subscription pays for itself. Sound reasoning alright, but just didn't get the cheque across to them (wasted a cheque leaf in the process). The quality of content is better than what I remember of the Delhi or Kolkata editions, but not something that makes me want to throw away 'The Hindu'. Like I said, the TOI seems to have got it right. With a hint o f smugness, today's paper tells us that they will set right their distribution; that makes me feel very guilty about depriving early subscribers of their due. 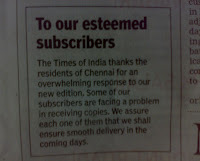 I should have told my paperkaaran yesterday (once again) that I do not want the TOI. Will do that today. The British Council in Chennai has this nice backdrop in the library. They don't take it too kindly to folks pointing cameras inside so I've had to be content with this photo, taken when there was the ceremony of distributing certificates to children who'd completed the 'Big Wild Read' programme. 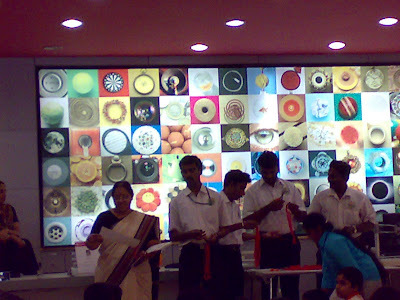 The British Council Library (BCL) in Chennai has been around for quite a while. I always get to it feeling that it is one of 'my places' - after all, I've been going there since the early '70s: but once inside, the BCL seems to tell me that it expects me to be more regular in coming there. And so the promise is made, to spend more time in the BCL. Until the next excuse comes up! The wisp of smoke climbing up from behind the facade is certainly not from a steam engine pulling into the Madras Central. That age is gone, of course, and has taken with it one of the stock shots of Tamil / Malayalam movies - the hero arrives in the big, bad city. Though it is now the headquarters of the Southern Railway, this wasn't the first, or even one of the important railway stations for quite a while. The stations at Royapuram (one of the oldest in India), Trichi and even Madras Egmore could reasonably claim to have had a greater importance for most of the 19th and the early 20th century. But as it stands, it is one of the most crowded stations in the country, partly because it has just 13 platforms to serve the long distance travellers. In recent years, changes to the frontage have given more prominence and visibility to the red and white building that has been lording over Chennai for just over a century, now. I believe the best time to be there is early in the morning, when the station is still cool and everyone in it is optimistic about the day ahead! So what's missing here? Over the past few days, the Corporation of Chennai has been at it, chopping down hoardings and revealing parts of the city that have been hidden for decades. Was too surprised to photograph the missing cinema hoardings in front of the Presentation Convent at Thousand Lights - they have been one of the defining features of the city, and now they're gone! Got this new view, though, at the Spencer's Junction: it used to be hidden by the Amul hoarding, but now Quaid-e-Millat college shows off its green! There are so many other parts where such hidden beauties are coming to light; and there are also many places where the skeletons of the hoardings are now covered with rags and make for a more unsightly skyline than earlier - maybe it does have to get worse before it gets better! Guess what? This had to start a day earlier! Somehow Tamil New Year has (almost) always been on April 14th.. but this year it has come a day early. This is the last time that the Tamil New Year is being celebrated in the month of Chiththirai; it has been decided that, from the next year, the first of Thai will be considered the start of the Tamil year. Maybe a good thing to do, because there never did seem to be much excitement around this New Year day. Even at Kapaleeshwarar Temple, there didn't seem to be that many people; I'm sure that Pongal day will find the temple tank much, much more crowded than this!